an awesome new release...the Sweet as Honey Collection! Instructions: Card size is 6” x 6”. Cut Pearl White Metallic cardstock 12” x 6”. Score at 6” on the long side and fold to create card base. Cut designer paper from the Backyard Blossoms paper collection 5 7/8” x 5 7/8”, ink the edges with Tiger Lily and adhere to the card base using dimensional tape. Cut another piece of designer paper 5 7/8” x 5 7/8”, ink the edges and adhere to the inside of the card using dries clear adhesive. Diecut the largest Eyelet Oval from Pearl White Metallic cardstock. Diecut two of the Decorative Medallions and adhere the to the back of the eyelet oval using dries clear adhesive. Adhere to the card base using dimensional dots. Diecut the second largest oval and adhere with dimensional dots. 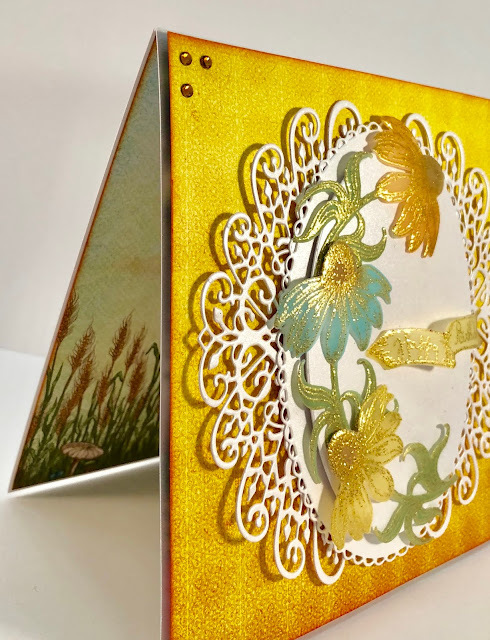 Stamp the Garden’s Edge Coneflower on vellum three times using Versamark, sprinkle with pearl gold embossing powder and heat set. Color all the leaves using Olive Archival ink and color all the cones with Coffee Archival ink. 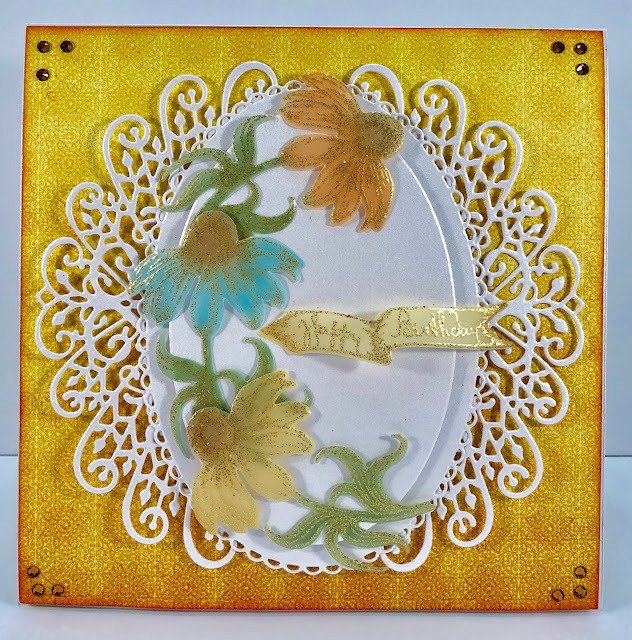 Color the flowers using Tiger Lily, Sunflower and Aquamarine Archival inks. Do all of the coloring on the front of the stamped images. Use a paper towel to remove excess ink. Diecut using the coordinating die. Lightly shape using the deluxe flower shaping tool and adhere as shown using dimensional dots. Stamp the sentiment from the Young at Heart Collection on vellum using VersaMark, sprinkle with Pearl Gold embossing powder, heat set and diecut using the coordinating die. 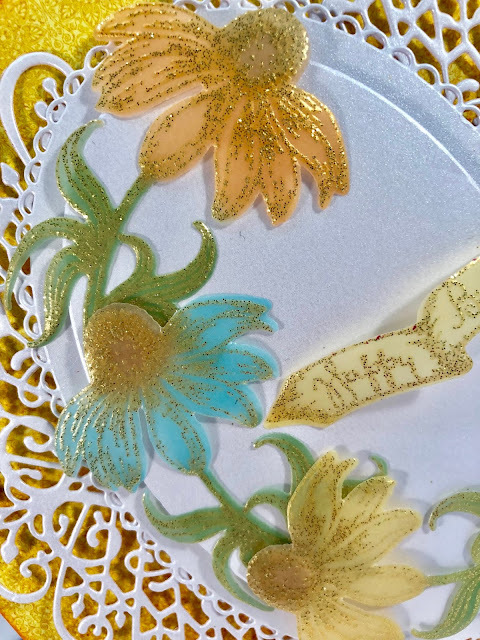 Color with Sunflower Archival ink, shape using your fingers and adhere at the tips using dries clear adhesive. Hold in place until dry. Add topaz Swarovski crystals to all four corners as shown. Please be sure to visit the Heartfelt Creations Blog to see all of the beautiful projects created by the amazing design team! Thank you so much Uma! This is lovely! Love how you framed the oval! Gorgeous flowers as well. Well done you! Beautiful card - love all the embossing!! Beautiful Janet! I love the vellum and gold embossing! !